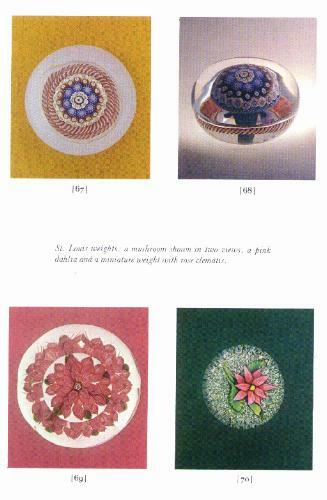 Estelle Doheny (1875-1958) had one of the most spectacular collections of glass paperweights of the 20th Century. She did not start collecting paperweights in earnest until after the death of her husband in 1935. Guided by dealer C. W. Lyons of New York she built her very impressive and high quality collection over the next ten years. She did this without the benefit of written books on the subject. Most of the paperweights were collected in the years before the publication of the first book on Glass Paperweights by Evangeline Bergstrom in 1940. Doheny lived in Los Angeles and was fearful of damage to her collections (books, furniture, paperweights, and other decorative arts) due to the threat of Japanese bombing and invasion during World War II. She dispatched many of these to St. Mary's for safekeeping. At the end of the war she retrieved them, had custom displays made for 176 of the paperweights and returned them permanently to St. Mary's Seminary. 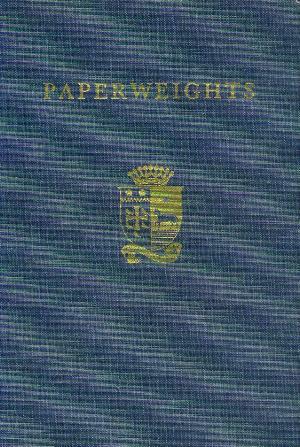 The other 244 weights in Doheny's collection were given to St. John's Seminary in Camarillo, California. Mary Redus Gayle was a curator for the Doheny Collection. The book documents the collection. This is the rarest of all paperweight books. Only 550 numbered copies were printed in a private printing and they were given away to friends of the publisher. None were sold and fewer than 200 ended up in the hands of paperweight collectors. All of this makes it a good addition to a serious collector's library. The St. John's portion of the collection were auctioned off by Christie's on February 3&4, 1988, 30 years after Doheny's death. The St. Mary's portion was auctioned off by Christie's on December 17, 2001. 95 pages. 110 color plates plus 3 black and white plates. 6 1/4" by 9 1/4". Hardbound. 1971. Published with no dust cover.